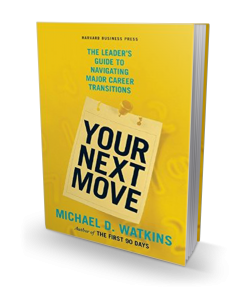 “Whether you’re going for that promotion, looking to jump ship, or change careers entirely, Michael Watkins’ Your Next Move is a book you’ll want to read.” So starts the positive review of Your Next Move on the influential 800CEORead website. It’s true that all leaders – no matter how seasoned – need guidance through the professional changes that define a career. In fact, transitions into new roles are the crucibles in which leaders get their toughest tests, and they’re the defining factor in professional careers today. Yet far too often, leaders fail to transition effectively into new roles. The resulting costs are high, for individual careers and for organizations. 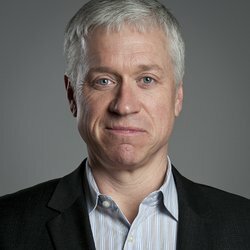 In Your Next Move, leadership-transition guru Watkins shows how you can survive and thrive in all the major transitions you will face during your career—including promotions, leading former peers, on-boarding into a new organization, making an international move, or turning around or realigning an organization. With real-life examples and case studies, Watkins illustrates the defining hurdles associated with each type of transition. He then provides the insights, strategies, and tools you’ll need to accelerate through these crucial turning points and continue moving up in your career. The necessary complement to the author’s bestselling guide The First 90 Days, which has been translated in more than 20 languages worldwide, Your Next Move offers the keen observations, tried-and-true management wisdom, and practical good sense Watkins is renowned for. It’s a vital resource for any manager or executive seeking to maintain career momentum. Watkins is a co-founder of Genesis Advisers, a leadership development consultancy located in Massachusetts. He also gives speeches on leadership, organizational transformation, and transition acceleration to executive audiences, as well as designs and delivers senior executive team meetings, and coaches newly appointed senior executives and their teams during transitions.